This week, the varsity tennis team welcomed two teams onto their home courts. On Tuesday, April 2nd the Lions played Trinity Christian Academy, led by former St Mark's coach Lance Hagan, in a scrimmage. On line 1 singles, sophomore Max Wu played the toughest and longest match against a very consistent player and eventually lost only by a couple of points 6-4, 4-6, 11-13 in the 3rd set tiebreaker. At line 2 singles, freshman Alex Ryan played his first match for the team and quickly closed out his match 6-0, 6-2. Freshman Ekansh Tambe played at line 3 singles and also made his debut in the lineup and didn't take any longer to finish his match 6-1 ,6-0. At line 4 singles, junior Austin Zang played an aggressive game and took over the net to win his match 6-4, 6-4. Line 5 singles saw freshman Miller Trubey take care of his match and used his lefty skills to defeat his opponent 8-1. At doubles, Sid Vattamreddy and Samir Rattakonda used their match to warm up for Friday and won 6-2, 6-1, the familiar duo of Creston Brooks and Rhys Arana won 6-0, 6-2, and Alex Piccagli and Emmett Berger won 6-4, 6-0. On Friday, the Lions faced their toughest opponent to date, ESD, who had also gone undefeated in conference matches. The competitive spirit was in high gear as the Lions fought through some very challenging matches. At line 1, Mark Motlow got ahead in the first set but the added experience paid off for his opponent, former Marksman Callaway Clark, who came back to win the set and the match 5-7, 2-6. Freshman Jeremy Yu got outmatched on line 2 and had a hard time converting game points. He was defeated 1-6, 0-6. Alex Piccagli stepped in for line 3, but couldn't quite keep up with his opponents' tough groundstroke game and was defeated 1-6, 0-6. The doubles lines exhibited some high-level tennis and kept the fans on their toes the entire evening. At line 1, seniors Adnan Khan and Matthew Pollock made a huge comeback after losing the first set 0-6 and turned their game around, but they fell just short of winning the match (0-6, 6-4,4-6). The line 2 duo of seniors Samir Rattakonda and Sid Vattamreddy also made a huge comeback after losing the first set a very close 6-7, they fought hard to earn the second set 7-5 and were within points of winning the final set, but lost it 5-7. Overall, the Lions played some great tennis but some more work still needs to be done to defeat the Eagles in the future. This week, the Lions will train in preparation for two key SPC North Zone matches next week: @ FWCD on April 16 and vs. Casady on April 18. The varsity track and team enjoyed another very successful outing at the Lions Relays hosted by Prestonwood Christian Academy. Under ideal weather conditions, the Lions came away victorious in the team race. Looking at the results, you will see the team was, once again, led by the talented distance corps. The Lions swept the 800m, 1600m and 3200m. The 800m race was the highlight with all 5 runners posting PRs! Senior Seth Weprin won the race with 2:00.06, second was junior Pablo Arroyo in 2:00.55, third was junior Andres Arroyo in 2:01.57, fourth was senior George Lamb in 2:02.57, and fifth was freshman Sahil Dodda in 2:07.70. Also enjoying a good day was sophomore Kit Colson with wins in the 100m & 200m. Fellow sophomore Colin Bajec had a good day with PRs in the high jump, 100h, and 300h. The 4x400 Relay also posted a season best. In the field events, it was freshman Sam Eluemunoh with big throws of 122’ 4” and 35’ 4.5” in the discus and shot put, respectively. Sophomore Cristian Pereira had a PR of 20’ 0.5” in the long jump. This week, the Lions have a small Pre-ISAS meet at Greenhill on Wednesday and then get ready for the SPC North Zone Meet the following Thursday. The team is in the last four weeks of the season and preparation for the SPC Championships has begun. Last week, the varsity baseball team played a rare night game on the turf over at Bishop Lynch. Despite scattering two runs early in the game, sophomore lefty Daniel Sanchez pitched four strong innings for St. Mark’s. Down 0-4 in the top of the 7th inning, the never-say-die Lions generated a two-run rally started by seniors Parker Davis and Cole Arnett before finally falling to Bishop Lynch. 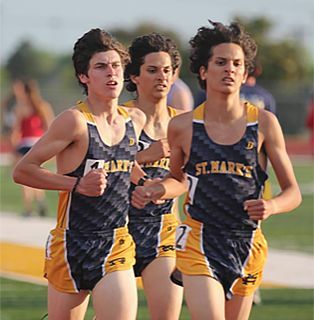 Returning to conference play on Friday, St. Mark’s played ESD in a classic rivalry game. Although senior Cole Arnett gave up a two-run homer to ESD in the top of the first inning, he kept the Lions in the game through 6 2/3 innings of steady work. Like the Lions had done the previous week against Greenhill, St. Mark’s scored a whopping nine runs in the 5th inning. Key hits and runs scored during the offensive explosion were recorded by seniors Daniel Mirochna, Jack Rocchio, Connor Pierce, and Colin Neuhoff; juniors Mason Rareshide and Aaron Thorne; and sophomore Daniel Sanchez. At 3-1 in conference play, St. Mark’s now sits alone in third place, trailing both Fort Worth Country Day (3-0) and Trinity Valley (3-0). The Lions play TACA at home Monday and TCA away on Tuesday in two non-counter contests this week. The varsity golfers competed in 3 events in the past 8 days. On April 1st, James Rogers, Romil Mathur, Camp Collins, Tony D’Apice, and Rex Corey made the long drive to The Woodlands for 18 holes at Woodforest Golf Club, where the SPC tournament will be held in 3 weeks. The team posted a group score of 332, which was 6th best in the field. Junior Will Rocchio, who also competed as an individual, carded a pair of birdies in his first 18-hole event for the team. On Thursday, six Marksmen competed against Greenhill in a 9-hole match at Brookhaven Country Club. Senior Alex Tate played well but lost narrowly to Greenhill's #1 golfer. Fellow senior Wheeler Sears also suffered defeat in the #2 slot. However, freshman George Warren (who shot a 37!) and sophomore Sai Thirunagari (41) both won their matches to set up a wild finish in the final foursome that was all square heading into the 7th hole, which was won by Greenhill's two players. But freshmen Dylan Dropkin and Jake Robinowitz rebounded with a strong 8th that included clutch putting to give themselves a chance at a dramatic comeback win. With scoring still unresolved after 9 holes, the action went to a playoff where both teams struggled off the tee. Unfortunately for the Lions, some nice up-and-down play from Greenhill ultimately forged them a 4-2 win. St. Mark’s built off that valuable experience with a solid tournament outing on April 8th. Romil Mathur's 80 led the way, followed by Camp Collins & Mac McKenzie (82 each), and Anashay Monga & Tony D'Apice (87 each). The 5 varsity competitors combined for a 331, just 4 strokes away from 2nd place and 9 strokes off the championship team. In the JV division, St. Mark's landed all 3 of the top spots, as James Rogers and Rex Corey both shot 83, and Jodie Thompson finished with an 88. A four-way match with Trinity Christian, ESD, and Shelton awaits the Lions this coming week before the Chick-Fil-A Invitational on Monday, April 15. The varsity lacrosse team played in two THSLL North District games last week. On Tuesday, the Lions traveled to Frisco. The Lions defense was stifling and limited the opponent to just 3 goals on the night and St. Mark’s won the game 7-3. Seniors Blake Rogers and Jonathan Taylor locked up the two top scorers which took away much of Frisco’s scoring threats. The team’s scoring came from: senior Lyle Ochs (2 g, 1 asst), junior Titus McGowan (2 g), Charlie Rose (2 g), and Connor Cheetham (1 g). Facing off, John Burton won 13 of his 15 total chances. On Friday, the Lions hosted Rockwall on Senior Night. Rockwall was ranked in the top 10 in the state at the time. The Lions led 5-1 at the half and then 7-2 at the end of the 3rd quarter. St. Mark’s used very balanced scoring and senior Jonathan Taylor had a major impact on the game on defense by forcing a lot of turnovers. Long Stick Midfielders, Carr Urschel and Will Kozmetsky did a great job limiting a productive Rockwall midfield as well. Final score: St. Mark's 10 – Rockwall 4. Scoring for the Lions were: Charlie Rose (2 g, 1 asst), Colin Campbell (2 g, 1 asst), Lyle Ochs (2 g, 1 asst), Titus McGowan (1 g, 1 asst), Ian Mize (1 g, 1 asst), Parker Clark (1 g, 1 asst), and Ryan McCord (1g). John Burton was 13 of 18 facing off and Landon Wood recorded 9 saves in the goal. This week, the Lions have one game at Plano West on Wednesday at 7:00 p.m. at Clark Field. The varsity crew team travels to Austin, TX this Friday to compete in the Texas Rowing Championships on Lady Bird Lake. Taylor Jenkins ’03, an assistant coach for the NBA’s Milwaukee Bucks, has help the Bucks to the best record in the NBA as they secured home court throughout the NBA playoffs which begin on Saturday, April 13th. Zach Landry ’18, a freshman on the Haverford Men’s Baseball team, has earned the starting job at 2B and has helped the team to a 4-2 record in their conference. Zach is 5th on the team in On Base Percentage (.342), 2nd in triples, and 1st in Hit by Pitch (7). Garrett Mize ’18 is the highest scoring freshman on the Washington & Lee Men’s Lacrosse roster. He is tied for 4th overall in goals scored on the W&L roster, notching back-to-back hat tricks earlier in the season. Daniel Cope ’17, a member of the Washington & Lee Men’s Track and Field team, recorded a personal best in the 5000m with a time of 15:10.77. He was also a member of the Distance Medley Relay which won the race and helped the Generals to their 3rd straight Indoor ODAC Championship.